According to a new report by the Joint Research Centre (JRC), the European Commission’s science and knowledge service, Blockchain will end paper-based certificates, automate the award, recognition and transfer of credits, increase learner ownership and control over their own data, reduce institutional data costs and risk–but only if open standards are adopted. Blockchain is a distributed ledger that provides a way for information to be recorded and shared by a community. You’ve undoubtedly heard about Bitcoin, the cryptocurrency that was the first use of blockchain, and it’s recent stratospheric rise in value ($15,000 per coin as of 12/9). Blockchain entries are permanent, transparent, and searchable, which makes it possible for community members to view transaction histories in their entirety. Each update is a new “block” added to the end of a “chain.” A protocol manages how new edits or entries are initiated, validated, recorded, and distributed. With blockchain, cryptology replaces third-party intermediaries as the keeper of trust, with all blockchain participants running complex algorithms to certify the integrity of the whole. JRC concludes that blockchain applications for education are still in their infancy. Benefits will only be achieved through open implementations with solutions whose fundamental components include: a) recipient ownership; b) vendor independence and c) decentralized verification–and that will take public-private partnerships. Blockchain has the potential to release a wave of innovation around learner data including ending paper-based certificates (and no more calls the registrar’s office to find or verify a diploma or certificate). It’s also likely to disrupt the market in student information systems. With portable cryptocurrency payments and smart contracts, learning gets really interesting. A state or institution could fund a student’s account using blockchain-based smart contracts and provide all the funding up-front. The smart contracts would release it when certain criteria are met. There’s obviously a lot of EdPolicy to figure out: desirable experiences and skill verifications, eligible providers, and terms and conditions. 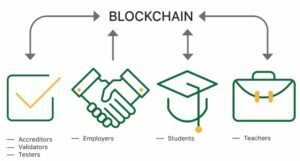 A KnowledgeWorks report on blockchain envisions “vibrant learning ecosystems that are learner-centered, equitable, modular and interoperable, and resilient. That level of transformation will require U.S. education stakeholders to innovate boldly, even going so far as to reconfigure some of the underlying structures that support learning.” The 2016 report suggests that blockchain and smart contracts are likely to play an important role in a more learner-centered system, one that adapts to each child instead of each child having to adapt to the system. What’s next? The JRC report urges development of open standards for educational records and continued community conversations about the advantages of blockchain technology. While blockchain will make it easier to share credentials, it leaves wide open the question of who creates and grants certifications. Employers and educational institutions will need to decide what knowledge and skills are important and how those are developed and assessed. In some cases, machine scoring will be able to verify certain skill claims, but in many cases with important and multidimensional skills, human judgment observation will remain important.